Superyacht Sherakhan 69.95m (229’6”), built in 1966, Netherlands. Superyacht Olivia70m (229’8”), built in 2010, Finland. Superyacht Freedom70m (229’8”), built in 1999, Italy. 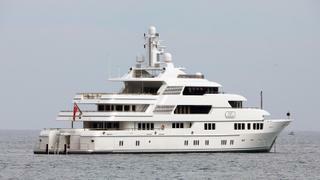 Superyacht Nourah of Riyad70m (229’8”), built in 2008, Turkey. Superyacht High Power III70m (229’8”), built in 2011, Italy. Superyacht Joy70m (229’8”), built in 2016, the Netherlands. Superyacht Galactica Super Nova70.07m (229’10”), built in 2016, the Netherlands. Superyacht Saint Nicholas 70.2m (230’4”), built in 2007, Germany. Superyacht Martha Ann 70.2m (230’4”), built in 2008, Germany. Your definitive guide to the largest superyachts in the world counts down from 200, revealing the biggest private boat at the last page of this article. Updated regularly, this is the most authoritative source of its kind that adds the biggest luxury yachts to the list once they are delivered. In 2018, we have seen nine new deliveries join the ranks of the world's largest superyachts, including a new arrival in the top 20. Converted from a Dutch merchant marine training vessel, Sherakhan features an amazing 22-seat dining saloon that rises 7 metres through two decks, illuminated by panoramic windows and light that filters in through the 18-person glass-bottomed spa pool in the deckhead. Suites range from 30 to 50 square metres and feature interesting décor and style. The owner’s suite has a revolving bed, a private terrace and a combined lounge and study that can be converted into an independent double with its own bathroom. The remaining 10 guest cabins (four doubles, four twin/double convertibles, and two smaller twins that each link to a double making them suitable for children) are equipped in similar fashion to the owner’s suite. Eight further cabins provide accommodation for nannies or staff. Other facilities include a beauty salon, massage rooms, a sauna and a fitness room. Her most recent refit at Icon Yachts in 2017 saw her classic dark blue hull finished replaced with a more modern white look. Sherakhan is featured in The Superyachts, Volume 19. A conversion from a USSR ice class hydrographical survey vessel into a yacht between 2008-2010 by OY Laivateollisuus and Rouvia Road Yacht Design & Construction, she was named Delta Bravo One. Now named Olivia, she is RINA classed. Although Freedom (ex-Reverie) is the third longest yacht (after Kingdom 5KR and Lionheart) to be built by Benetti, she is the second largest in terms of volume. 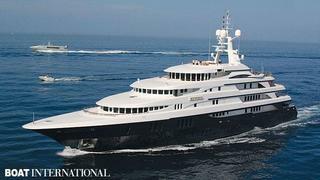 Built for Norwegian businessman Inge Rokke, she was sold to an American in 2004, reportedly Peter Sperling. She has six decks, all connected by a lift. One deck is reserved for the owner’s party. It offers a private sitting room and study and two family cabins in addition to the master suite, where the bedroom is adjoined by vast his-and-hers en suites. Accommodations include a VIP suite on the main deck and four guest suites on the lower deck. The yacht has two dining rooms, one in formal baroque style, the other more casual. 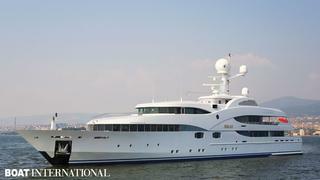 She is featured in volume 22 of The Superyachts. Nourah of Riyad was the largest yacht to be constructed in Turkey at the time of her launch, and was built while the yard was being developed around her on land reclaimed from the Gulf of Izmit. Donald Starkey’s exterior design features vertical bridge windows, ample deck spaces and mezzanine deck levels that create more space in the crew areas and improve visibility from the bridge and the master suite. The light and airy interior includes two master suites forward on the main deck, a main deck VIP, six guest cabins and a cinema. A large dining saloon for up to 36 people is located on the upper deck, while the main saloon features side doors that give access to balconies created from outward-folding bulwarks. Her impressive 26.5 metre-long sun deck can be accessed by both the internal stairwell and a lift, and features a dayhead, shower and a large spa pool flanked by sun mattresses. 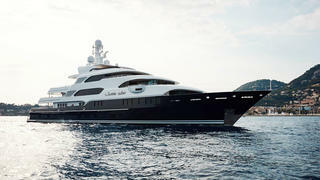 She is featured in The Superyachts, Volume 23. Mid-2010, Nourah of Riyad came back to her yard for a refit, her stern was lengthened by five metres, a bulbous bow was added and the layout of the sundeck was modified. High Power III (ex-Numptia) offers a spectacular variety of large exterior deck areas. The owner’s meticulous attention to detail is reflected in a dedicated spa deck, complete with beauty salon, massage room, sauna, Turkish bath and a fully equipped gymnasium. High Power III accommodates 12 guests in six spacious guest cabins (full beam master suite, VIP suite, three queen-size double guest cabins and one twin guest cabin). All decks can be accessed via an expansive circular staircase and a glass elevator which links four decks runs through the heart of the yacht. 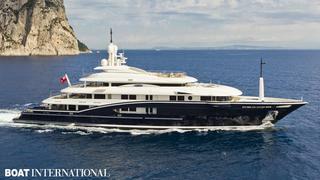 She is featured in volume 26 of The Superyachts as Numptia. Launched by Feadship in June 2016, Joy was a particularly significant superyacht for London-based studio Bannenberg & Rowell as she represented their first exterior design, with chamfered bulwarks channelling light into her Studio Indigo interiors. Accommodation is for 12 guests split across six cabins. Built from a steel hull and aluminium superstructure, Joy is powered by twin 1,850hp MTU diesel engines for a top speed of 16 knots and a maximum cruising range of 4,500 nautical miles at 12 knots. Her name refers to the joy of exploration and was inspired by the statue of Christopher Columbus in New York. 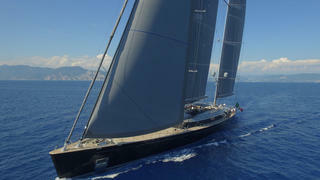 Commissioned for serial yacht owner Bill Duker, Sybaris is one of the largest yachts built by Italian yard Perini Navi to date, second only to the 88 metre Maltese Falcon (number 62 on this list). Her carbon-fibre rig includes two masts, which measure 72 and 62 metres respectively. Naval architecture, exterior design and sail plan optimisation are all by Philippe Briand, while her interiors were styled by PH Design. Accommodation is for 12 guests, split across six cabins, and her total interior volume of 870 gross tonnes also allows for a crew of up to 11. Delivered in May 2016, Galactica Super Nova is the current flagship for Dutch yard Heesen Yachts. 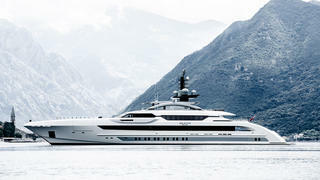 She is the largest yacht to date to feature the Fast Displacement Hull Form, as designed by Van Oossanen Naval Architects, allowing a top speed of 30.3 knots. Interior styling is by Sinot Exclusive Yacht Design, while the exterior lines are by Espen Øino. 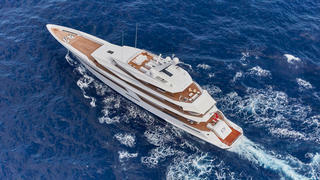 First revealed in 2014 and developed under the codename Project Kometa, Galactica Super Nova features an aft-deck lap swimming pool that is fed by a waterfall from the deck above. Accommodation is for 12 guest across six cabins. Built under the project name Nemo, this is the second of three almost identical sisterships ordered from Lürssen Yachts by an American yachting entrepreneur. The first, Project Marlin, was named Apoise (now named Titania, refitted, extended and No 169 in this list). Owned by a Russian, boasting a classically styled interior by François Zuretti, she offers a ‘play deck’ with an enclosed nursery/playroom. Outside is a huge sunbathing area that surrounds a swimming pool equipped with a swimming jet at one end and an ‘in-water’ bar — complete with semi-submerged bar stools — at the other. 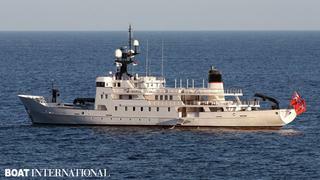 The third yacht, Project Shark, now Martha Ann (No 173 in this list), was retained by the commissioning owner. Saint Nicolas is featured in The Superyachts, Volume 21. Her accommodation, decorated with exotic materials such as parchment, palm wood, mother-of-pearl, shagreen, bamboo and buffalo hide, is laid out over six decks, and, in addition to a 427 square metre master suite located forward on the main deck, includes four double guest cabins on the lower deck and a VIP cabin on the bridge deck. Entertainment and outdoor areas, which include a gymnasium and a large spa pool with an integrated bar, are generously proportioned. Fully MCA compliant, the yacht is available for charter.